Our faith in Jesus Christ is at the heart of JPCatholic. We strive to create a campus environment where both students and faculty can grow in their relationship with Christ through Sacred Scripture, the Sacraments, and the Magisterial teaching of the Catholic Church. We take our responsibility as a Catholic university seriously, and all of our faculty commit to harmony with Church teaching. Our core curriculum is rooted in rigorous study of Sacred Scripture, Catholic theology, and philosophy, as well as the great literature, art and music of the Church and of Western Civilization. Our core integrates Scripture with the study of the creative arts and business innovation, thus bringing the light of Christ to their creativity and innovation. In order to Impact Culture for Christ, one must first come to know and love Him in a profound way. Our campus provides many opportunities for spiritual growth through daily Mass and the Sacraments, Eucharistic adoration, spiritual direction, and community prayer such as the Rosary, Divine Mercy Chaplet, and Liturgy of the Hours. While Mass attendance is not required, students’ class schedules are structured around the Mass, giving everyone on campus the freedom to attend. We also have an active campus ministry, households, organized retreats, and service opportunities. John Paul the Great Catholic University is proud to have been consistently featured on the Newman Guide’s list of recommended Catholic colleges year after year. You can view JPCatholic’s profile on the Newman Guide here. 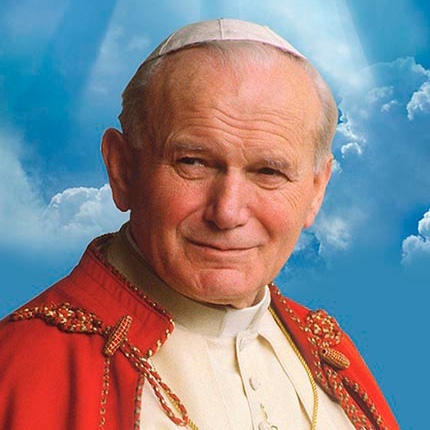 John Paul the Great was born Karol Wojtyla in Poland in 1920. He spent his early life acting in local theater before deciding to study for the priesthood, which he did in secret while Nazis occupied Poland during World War II. Ordained in 1946, he returned to Poland as a parish priest and then as a university instructor. He became a bishop at the age of 38 in 1958, was named archbishop in 1964, and was made a Cardinal in 1967. He was elected to the Papacy in 1978. During his Papacy, John Paul the II called the Catholic Church to engaged the world with a New Evangelization, using modern methods of communication to spread ancient truths of our faith. His many encyclicals, inspirational world-wide travels, and the creation of the Catechism of the Catholic Church enriched the deposit of faith and brought countless souls closer to Christ. 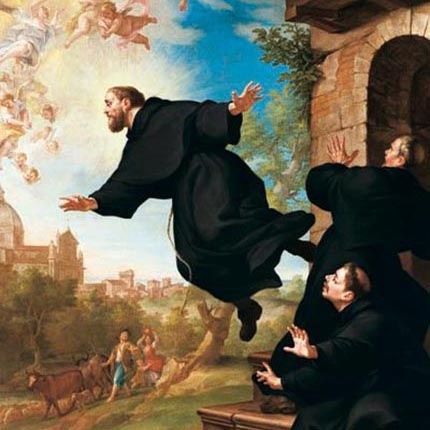 St. Joseph of Cupertino is the patron of students taking exams. He was born to a homeless and widowed mother in a stable in 1603 near Naples. Though rejected by the Franciscans because of his ignorance and dismissed by the Capuchins because of his ecstasies, hope and continual prayer landed him a job in a Franciscan monastery stable. Ordained in 1628, he was infused with supernatural knowledge, surprising many with his ability to answer intricate questions despite reading poorly. His life was a long succession of visions, ecstasies and levitations that would occur frequently during Mass caused public admiration but disturbance to his community and for 35 years, he was not allowed to say Mass in public. He died in 1663, was beatified in 1753, and was canonized in 1767. 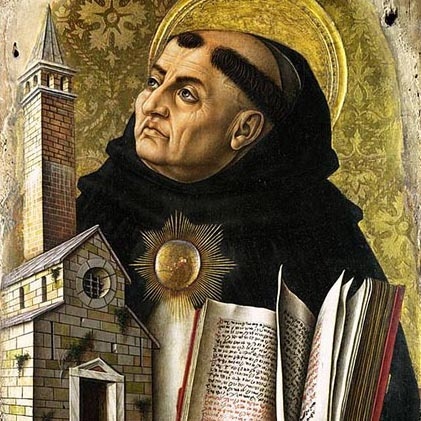 An Italian Dominican priest, St. Thomas Aquinas is considered the Church’s greatest theologian and philosopher. Known as the Angelic Doctor or Doctor Universalis (the Universal Doctor), he is the father of the Thomistic school of philosophy and theology. His influence on Western thought is considerable and much of modern philosophy was conceived as a reaction against, or as an agreement with, his ideas, particularly in the areas of ethics, natural law and political theory. Aquinas is held in the Church to be the model teacher for those studying for the priesthood. The works for which he is best known are the Summa Theologica and the Summa Contra Gentiles. He is one of the 33 Doctors of the Church. Genesius was an actor hired for a play that made fun of Christian baptism. At the start of the play before the emperor Diocletian, Genesius was lying sick on the stage. Asked what was wrong, Genesius said he felt a great weight that he wanted removed. Two other characters, a priest and exorcist, were summoned. They asked what he wanted, to which he replied ‘Baptism’. Immediately, he saw a vision of angels carrying a book inscribed with all his sins. 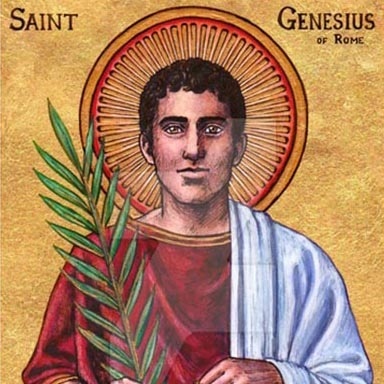 The priest asked ‘My child, why did you send for me?’ Then Genesius asked to be actually baptized himself onstage. Enraged, Diocletian turned him over to the prefect of the praetorium, who tortured and ultimately beheaded him.